When it comes to driver recruiting, you do a lot to convince drivers you’re the right pick. You empathize with their pain and offer solutions. You cater to their interests. You demonstrate how what you offer is the right match for their needs and preferences. Despite all your efforts, you still fall short when it comes to getting all the drivers you need. It’s the inevitable effect of the continuing driver shortage. As overwhelming as the shortage is, you’re not entirely powerless against it. There are still ways to make your efforts to attract drivers more visible. One of the most powerful ways to do just that is through video advertising. According to our research, the two top social media platforms drivers use are Facebook and YouTube. We all know YouTube is the most watched video website in the world and Facebook has a strong and ever-growing video prevalence. So if drivers have embraced video, which they have, it’s no longer a question of whether you should use video advertising or not. It’s essential. Using the word “video” in an email subject line boosts open rates by 19%. Emails with the word “video” in the subject lines have a clickthrough rate increase of 65%. Video gets your message across faster than other formats. If a Picture is Worth 1,000 Words . . . I said all that to say that video can communicate so much more than plain text and static images. Combining visual and sound engages more senses and allows a viewer to process more information in a shorter amount of time. Adding a video to your webpage can increase organic traffic from search engines by up to 157%. Through our own tests, we’ve found that video advertising on Facebook and YouTube causes 3 times more people to search for your brand on search engines. This is a significant increase in branded search and thereby leads to an increase in brand awareness for your business. Video adds a personal touch. This goes back to the old saying, “seeing is believing.” It’s one thing to tell someone who you are and another for them to see it for themselves. 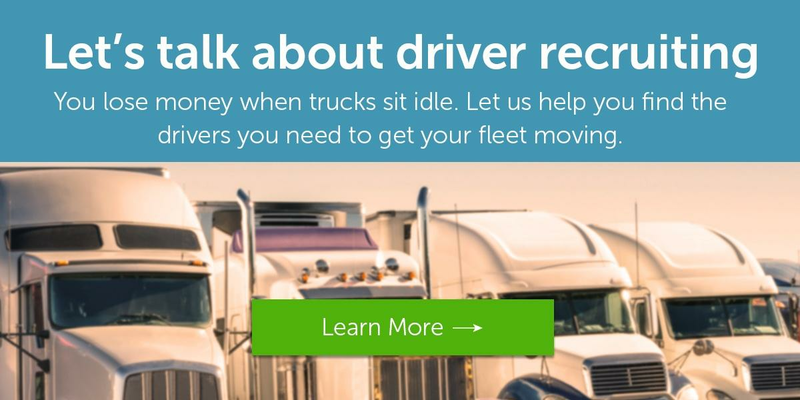 Seeing your business in motion and hearing from actual drivers who work at your company adds a personal touch to your advertising and makes you more relatable to drivers. Video allows you to give drivers a glimpse of the potential work experience at your business. As I mentioned earlier, our research shows that Facebook and YouTube are the two top platforms drivers used. This is a perfect match for your video advertising because of the strength of video on both those channels. You can upload a custom driver audience list to target on YouTube or target by demographics, interests, behaviors, etc. One of the perks of using YouTube is you’re only charged when your video ad is viewed. The way it works is when a viewer watches up to 30 seconds or engages with your ad (e.g. by clicking a call to action), you’re charged. In addition, YouTube offers different formats for your video ads. A skippable, online video ad that appears before the main video. A 6-second video that can be used to reach viewers with a short memorable message. These video ads appear in YouTube search results, on the YouTube homepage, and alongside related videos. Facebook’s audience targeting is similar to YouTube’s. You can target an uploaded list of drivers or target by demographics, interests, behaviors, etc. Through Randall-Reilly, you can match email addresses and/or phone numbers of known contacts to reach your specific audience of drivers. Through paid advertising, your video ads show up in driver News Feeds. Avoid using internal camera mics to record people speaking. People will sit through poor quality video, but not poor audio. To ensure you receive an impression, include branding within the 5 seconds before the skip option appears on your video. Make sure you’re reaching the right people. This goes back to targeting as specifically as possible, instead of just putting your ad in front of any and everyone. For video length, studies show that the shorter the better, but there are exceptions if the ad is very compelling. This brings us to good storytelling. Practice good storytelling to cultivate interest in your videos. Cater to driver pain points or interests. The world’s interest in video is ever-growing. This applies to drivers too. So if you want to gain the attention of drivers, your advertising has to align with the content they’re consuming. Drivers are consuming video, which makes it necessary for you to be present in the world of video advertising.